What Will Travel Look Like by 2030? This post brought to you by . The content and opinions expressed below are that of Meihoukai in Wanderland. Back in June, released the results of a survey that showed how millennials travel differently — and I dissected it here. This month, hungry for even more insights into the traveler mindset, they asked a new question, and I admit it’s a pretty fun one. 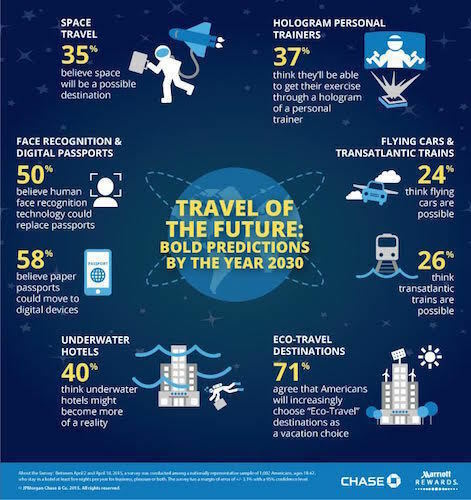 What will travel look like by the year 2030? A lot can happen in fifteen years. Fifteen years ago, I didn’t even have a cell phone — and thanks to I didn’t know if the world would last long enough for me to get one. Granted, I was ten — though I swear here in 2015 toddlers can operate their personal iPads with more dexterity than full grown adults display while using chopsticks. Back in my day, when you wanted to talk to your friends, you had to scan the school directory for their digits, have an awkward conversation with their mom, and then finally get down to the pressing matter of who forgot to feed the joint custody friendship that day. Ah, how times changed in fifteen years. Here’s what surveyed Americans think I’ll have to look forward to in fifteen more. For the most part… I hope they’re right! Here’s what got me buzzing about looking beyond the present. Nothing gets this aqua-holic going like the idea of spending even more time beneath the sea. Turns out, many of my fellow travelers think that in the near future, I won’t have to scuba dive to spend extended time underwater. Among travel experiences of the future, 40% think underwater hotels might become more of a reality in the next 15 years. The concept of underwater hotels isn’t exactly new, but so far it has yet to hit the mainstream, and it can be hard to find information about them beyond concept drawings and press releases. Here’s hoping that one day they’ll feel more substance than science fiction! There’s nothing green about the idea of traveling green – I believe the concept of consumers making eco-friendly choices on the road is more a cultural shift than travel trend. I have a hunch it will become even more of a priority over time, and survey takers agree: 71% of travelers agree that Americans will choose “Eco-Travel” destinations for vacations in the future. Of course, it’s easy to slap the “eco” label on just about anything, from jungle lodges to beach resorts. I hope consumers will take the time to dig a little deeper beyond those three little letters and look for destinations practicing sustainability in everything from respect for local resources to use of renewable energies. Travelers may love to complain about air travel, but they remain skeptical of the alternatives — of those surveyed, only 26% believe transatlantic trains will a become travel options by 2030, while only 24% had faith in flying cars. I’m not too fussed with flying cars – I find driving challenging enough with four wheels on the ground, thank you very much – but I do love the idea of taking a train from New York to Naples! Train tracks are one of my favorite ways to get from point A to point B. I can’t wait until the day this one becomes a reality – and hopefully security is handled by an organization . After years of hauling around a backpack full of paperbacks, I finally threw in the (paper) towel and added a Kindle to my carry on. But I still love the feel of flipping through actual pages, hence, I’d be devastated if this prediction came true: Some 58% of travelers surveyed believe passports could eventually become available for digital devices, while 50% believe human face recognition technology could replace passports altogether. I hope not! Nothing fires up nostalgia for travels past like flipping through the visa-plastered and ink-stained pages of a well-worn passport. At least in this case, I’m crossing my fingers for consistency. Want to look more to the immediate future of your travels? My top travel hacking tip is to build points for airfare and hotel stays through credit card spending. The Marriott Rewards Credit Card from Chase allows travelers to rack up accelerated Marriott Rewards points on all purchases. Bonus! There’s no foreign transaction fee, making it the perfect card to bring on your next international getaway. Keep an eye out for sign-up bonuses that can help you nab your first free hotel stay more quickly. Visit to learn more, and who knows — someday, you might be booking a stay on Saturn. What do you hope travel looks like in 2030? Aloha from Maui… and a Giveaway! I couldn’t agree more! I was so sad when I realized that going through the express line in customs in Australia meant that I wasn’t going to get stamped. I hope transatlantic trains become a thing too!! I am not a natural flier and love travelling by train so this is right up my street….flying cars….not so much. Right?! Seems like you’re just asking for more fender benders ha. I love the thought of the transatlantic train! Love these ideas, especially on transatlantic trains! I’m with the 25% that think transatlantic trains are the future. Might be later than 2030 though! Underwater hotels would be very interesting- I’m not sure how well I would be able to sleep. Couldn’t agree more! It’s one of my most treasured physical possessions. Indeed. I’m sure we’ll look back someday and be nostalgic for this time! While transatlantic trains may not feasible, I thought I read somewhere that trains might be able to connect Russia and Alaska in the future. Hopefully, that’s the case. Whoa! That would be wild. Can’t wait to see what the future brings! This is where it’s at for me. Take my money and let me feel zeroG while staring at the earth. Not only a thrill but entirely humbling to see the earth from that perspective. I’m most intrigued by the possibility of a Transatlantic Train. After sailing both ways across it all I can think is 1. Hmmm, I wonder how long it will take for that water view to become boring to it’s passengers, and 2. S&*t, one more thing for me to avoid hitting on the water!, haha. Yeah, I’m curious if they’d be underwater or across the surface or what. How fun to see what the future holds! Oh my, I love the thought of Aqua-hotels, who wouldn’t want to spend more time under water but I think that’s one of those things that I hope never follows through. We disrupt the sea life and the coral reefs plenty already with our garbage, our spillage, and even our clumsy selves sometimes. The future of travel isn’t something I’ve thought much about but as we go into the future along with new innovations we will need to also focus on our awareness of our environs that are becoming ever more popular travel destinations. Hm, I didn’t think about the environmental impact of an underwater hotel. I wonder if it would be much more damaging than simply a beachfront one. I’d be interested to read an environmental impact report on that! You got my attention on the picture that shows the predictions for 2030..had me fantasized on the future as well 🙂 But to be honest, it’s quite interesting. I love the ideas most especially the train but I would prefer flying cars..LOL. Though I think is not possible yet for 2030. But who knows, our technologies are adopting to change. Yeah, the idea of flying cars sounds like a headache to me! As much as I love trains – i am a bit skeptical about transatlantic trains. we can’t get our act together to build a high speed rail linking the eastern seaboard cities (the technology is there (and has been for years) that would allow us to travel between DC and NYC in under 2 hours), so i can’t image the airline lobby would ever allow transatlantic trains – sad. Believe me, I’d LOVE for them to finally get a high speed train between Albany and NYC. I’ve heard that if we had the same speed at the bullet trains in Japan, it would be a twenty minute commute!!! I’m dying for train travel to become more common! I spent some time in Russia this summer, and I was so jealous hearing about one of the Russian women I met tell me all about the Trans-Siberian. The longest train trip I have taken was from Berlin to Bruges, but I really enjoyed getting to look out the window at the countryside. I love traveling around Thailand by train too! I’m always bummed if I’m headed somewhere not off the tracks 🙂 I haven’t trained at all around Europe really… but do hope to someday. Great Post.Thanks. The longest train trip I have taken was from Berlin to Bruges, but I really enjoyed getting to look out the window at the countryside. That sounds like it would be a beautiful stretch of Europe! Very inspirational post. I love the idea about the transatlantic trains :-). Sounds like that’s everyone’s biggest request… I hope it happens! The images of the post are awesome. The imagination of 2030 is quite interesting, I would say it will be more advanced and comfortable from the present day. The whole world will look very little. The distance between the places will vanish away. Meihoukai, I must say you have a wonderful blog. Thanks for the kudos, Alice! I know that the campervan hire company Jucy is already rolling our electronic campervans in New Zealand. As part of the Travelling Green concept this fits right in, but the question is how to make GETTING to New Zealand an eco friendly concept.